That heat in September 1925 was brutal; temperatures reached or exceeded 100 degrees on 10 days during the month. It was 100 degrees as late as Sept. 22, and the heat peaked at 106 on Sept. 5. The sky will be partly to mostly sunny today and tomorrow with only a 5 to 10 percent chance of any one spot seeing an afternoon shower. FRIDAY AND THE WEEKEND: The upper ridge weakens a bit, and as moisture levels rise we will bring scattered, mostly afternoon and evening showers and thunderstorms back into the forecast on these three days. The chance of any one specific location seeing rain is in the 30 to 40 percent range; otherwise, look for partly sunny days, fair nights and highs in the upper 80s. The scattered afternoon showers won’t offer widespread rain, but some communities will see a good downpour. NEXT WEEK: The potential for random, scattered showers and storms will continue during the first half of the week, but rain should become more widespread by Wednesday and Thursday as an upper trough and cold front approach. 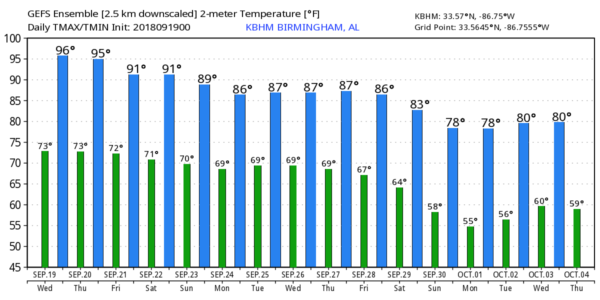 Following the front, noticeably cooler air will finally reach the Deep South late in the week. TROPICS: The Atlantic basin is very quiet considering we are still in the peak of the hurricane season; tropical storm or hurricane formation is not expected through the weekend. ONE YEAR AGO TODAY: Hurricane Maria reached Category 5 strength just before making landfall on Dominica, becoming the first Category 5 hurricane on record to strike the island. After weakening slightly from crossing Dominica, Maria achieved its peak intensity over the eastern Caribbean with maximum sustained winds of 175 mph and a pressure of 908 mb, making it the tenth-most intense Atlantic hurricane on record.